The DriveBus protocol is used to communicate with ABB Drives and ABB Special I/O units. DriveBus is connected to the controller via a CI858 communication interface unit. The DriveBus interface is used for communication between ABB Drives and AC 800M controller. The DriveBus communication is especially designed for sectional drive applications for ABB rolling mill drive systems, and ABB paper machine control systems. 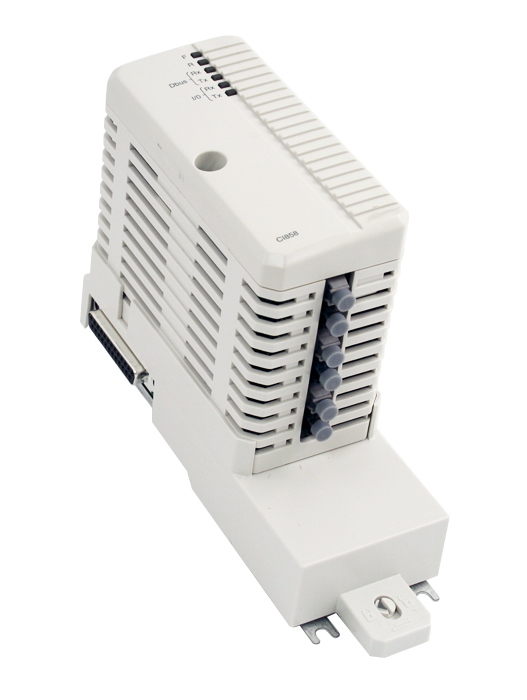 The CI858 is powered by the processor unit, via the CEX-Bus, and therefore does not require any additional external power source. A maximum of 24 ABB drives can be connected to one CI858 and a maximum of two CI858 can be connected to an AC 800M controller. If more than one ABB drive is connected to the CI858, a branching unit NDBU is needed, which enables the construction of a logical bus with physical star topology. The branching units can be chained.